Letting people know what's going on at your business or event is simple when you choose message flags from Attention Flag. 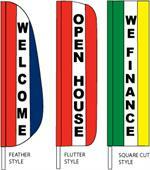 Our business offers quality stock and custom flags for all your needs, including custom feather and blade flags. 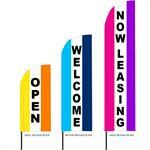 Whether you want to let people know that you are open for business with a stock message flag or are interested in getting a specific message out there with a custom message to attract people to certain areas of your event, such as your parking area, our business is able to provide you with high-end selections for your needs. 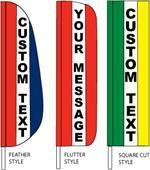 Our custom and stock rectangular message flags are perfect for use in many locations where the wind is inconsistent when flown on an angled spinner pole. All of our flags are made using UV coated nylon that was made in the United States, as well as sewn to the highest standards in the market. 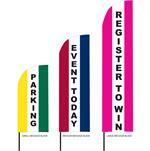 Take a look at these message flags and choose the items you need for your business or event today.